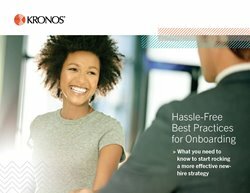 Does your company have the time and resources to make onboarding your new hires easier? There is a way to simplify the process - you just need a better approach. It's been shown that having a more effective onboarding approach can lead to better new-employee retention, reduced turnover, and getting new hires up and running more quickly.